The birth of pioneering Indonesian electronic book retailer Papataka was natural enough. Book lover An Kaliman was outraged by prices in Jakarta bookstores, believing the difference between the suggested retail price and the store price was a rip-off. So he decided to do something about it. 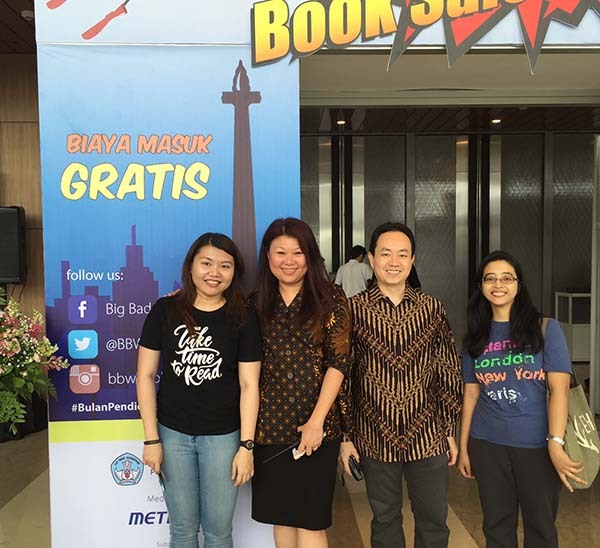 Kaliman joined fellow book lovers Roy Kurniawan and Anson Lesmana to launch Papataka in June. Within two months the company had more than 1,000 registered users and had sold more than 400 titles through its Web site. Papataka, which means “bookworm” in Sanskrit, now offers more than 150,000 titles, with the number rising every day. And although there are at least 100 Indonesian online book stores, only Papataka sells paperless ebooks. It sells books from about 100 local and international publishers and will soon add more Indonesian titles to meet demand. Many Indonesian publishers are just now offering their titles in digital form, and unlike their more-experienced Western counterparts, they are still learning how the process works. “Most local publishers are still clueless when it comes to electronic books,” Roy said. In the rapidly changing world of publishing, many online ebook stores have begun selling books by authors without publishing deals. But Kaliman said Papataka still preferred to work only with publishers. “Publishers have editors who refine an author’s work,” he said. “We will not reject authors who want to publish individually, but I honestly don’t think they will do well in the market”. One local publisher whose books are available on Papataka is Komunitas Bambu. So far, more that three dozen copies of the publisher’s six titles have been sold on Papataka. Komunitas Bambu director JJ Rizal said he was excited about the prospects for ebooks and expected everyone to be using them within 10 years. “The price of an ebook is 30 percent less than a hardcopy,” Rizal said. Still, some authors and publishers remain wary of making the switch to digital publishing, with many afraid of piracy. But Kaliman said all ebooks sold on Papataka were protected with Adobe’s Digital Right Management technology, which was extremely difficult to circumvent. DRM-protected books can be read on six devices. Publishers and authors aren’t the only ones having to adapt to the world of ebooks. Ebooks are new for many Indonesian readers, who also need ereaders to read the books. Papataka sells two ereader models, costing between Rp 2 million ($225) and Rp 3 million. “We could sell cheaper devices, but they don’t use E Ink technology,” Roy said. E Ink is a specific type of electronic paper created by E Ink Corporation. An ereader with E Ink technology holds a charge for up to 9,000 pages of reading and will not reflect light, as does one with an LCD screen. Most ebooks can also be read on a computer, but Kaliman said that doing so required readers to change their habits. He said ereaders were likely to win the hearts of book lovers, because they were the size of a book. While making the switch to ebooks is an adjustment, most Papataka users seem satisfied. Sutanto A. Pernama, 30, is a registered user who says he used to buy six hardcopy books a year. But since a friend introduced him to Papataka, he has no plans to turn back. The latest book he bought from Papataka is “Open: An Autobiography” by tennis legend Andre Agassi. “And there will be many more to come,” he said. To buy an ebook on Papataka, a user just needs to sign up, select a book, pay by credit card or bank transfer and download the content. The whole process takes about three minutes. Like other start-up business, Papataka still requires financial support from its owners, but both Kaliman and Roy said they were optimistic. They are sure the Indonesian market will be devouring digital content within 10 years. At the moment, Papataka is honing its business model and improving its site. The owners want to make the site easier to browse, then develop a mobile site that will sync with ereaders. As Indonesia’s only ebook retailer, Papataka is in an advantageous position. But its biggest advantage is surely the convenience that ebooks offer readers.